"1. 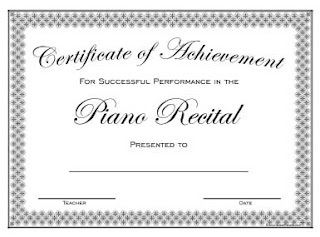 Recitals provide a tangible goal to work towards. In having a set date and a pre-planned performance selection, your child learns to manage their practice time and what it feels like to perfect and polish a piece. 11. Recitals give your children the chance to hear live music. Young children rarely attend a lot of live concerts… and piano recitals are a wonderful place for your child to hear a wide variety of music. Nothing can replace the “live music experience” and when your child is an active participant in the event, it’s even more rewarding! 12. Recitals provide an opportunity for you to sit back and marvel at the pride-inducing sight of your own child making beautiful music. Piano practice is often done amongst a busy household with siblings, pets, vacuums, dishwashers and doorbells. It’s rare that you have the opportunity to focus only on your child and the music they are making. These moments matter." In reading through these points, I couldn't help but remember some of my best and worst performances over the years, and the foundations they laid for me. Like the time, at age 9 or 10, when I couldn't even remember the first notes of my piece for a church performance, and learned some difficult lessons about necessary preparation and poise in the face of unexpected challenges. Or a recital in my freshman year of high school, during which a very young sister of one of my fellow students wanted to get up and dance in the aisle during my performance. I still remember my mom commenting afterwards, "if someone wants to get up and dance, you know you got it right," and I realized that performing isn't just about getting all the parts of the song hammered out correctly, it's about your audience and how you can create something that moves them. 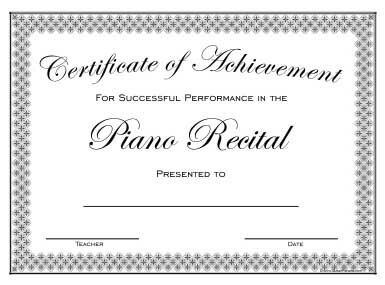 So, as we prepare for this upcoming Recital, remember all of the wonderful groundwork that is being laid as your kids take to the stage before a supportive audience of teachers, families and peers.